It’s the end of July already – but at least the sun is shining now, so there’s no excuse not to get out and about to the weekend markets in Cardiff and pay a visit to Eira on her InnerCityPickle stall. Wherever you live, check out your nearest markets and buy from local traders – it’s the very best way to keep your local economy thriving and it’s great for the environment too. Keeping it in the city, InnerCityPickle’s goodies can now be found at the Caesars Arms Farm Shop at Creigiau (CF15 9NN), so if you can’t make it to the markets, you needn’t miss out. There might be some delicious elderflower cordial left if you’re quick. We mentioned last month that InnerCityPickle will soon be appearing at the St Mary Street Market in the city centre. This has been delayed a little because the next two markets have been cancelled because of the Olympics. However, Eira will be at Roath Farmers’ Market on August 4th and 18th, and her first St Mary Street Market should be Saturday 11th. Why not pop along, have a taste of her delicious jams and pickles, and say hi. Details of forthcoming market appearances can be found here, and look out for a brand new InnerCityPickle blog for the autumn. You can also visit the InnerCityPickle website or follow on Twitter for all the latest news. 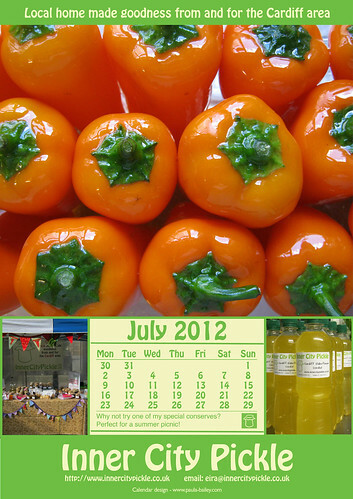 The calendar has been made using photographs taken by Eira and Sean, in the Cardiff kitchen “as it happens”. If you’re lucky you might pick up a printed version on the stall! To download August’s calendar page, just click on the image below and you’ll be taken to a full sized version which you can download and print. It works at A4 and A5 so take your pick! The September page will be available at the end of the month. If you don’t want to miss it, why not sign up to see new posts as soon as they appear. As usual, Eira’s been very busy in her Cardiff kitchen making wonderful things for you to enjoy. There’s caramelised red onion chutney, a new aubergine, pepper and tomato chutney, and tomato and celery chutney. She’s also just finished a one-off batch of ‘Mam’s Red Sauce’. If you’ve tasted her ‘Mam’s Brown Sauce’ you won’t want to miss that! All these lovely wares can be picked up at Roath market, and as from July 14th, Eira will be at the new city centre markets on the Saturdays she’s not at Roath. If you’re not living in Cardiff, it’s definitely worth paying a visit. Eira tells me there’s also a very lime green coloured lime pickle (because she used only green chillis) available this month and she has topped up her supplies of spiced carrot and garlic chutney, all of which you can now wash down with her wonderful elderflower cordial. Keep an eye on the Inner City Pickle website or follow on Twitter for all the latest details of market appearances and new lines. 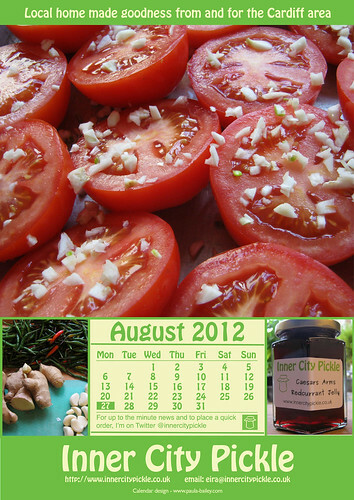 The calendar has been made using photographs taken by Eira and Sean, in the Cardiff kitchen “as it happens”. To download July’s calendar page, just click on the image below and you’ll be taken to a full sized version which you can download and print. It works at A4 and A5 so take your pick! The August page will be available at the end of the month. If you don’t want to miss it, why not sign up to see new posts as soon as they appear.